Since I'm posting reviews of my own work, I wanted to give a link to Squiretalk, where Squire is posting a link to a reader's diary for the Encyclopedia. I'm very gratified by how closely and carefully people are reading and only wish that Routledge's promised "team of professional copy-editors" had been so thorough (or that they'd incorporated any of my final round of corrections, or that they'd not told me not to bother marking "little things" like faulty spacing, etc., or that they'd even accurately incorporated my first round of corrections, the implementation of which, I've discovered, was haphazard at best. But I digress...). I also think that the reader's diary is a particularly interesting way to go about working through a reference work. I am reading very carefully and learning a great deal about how to improve my writing and editing (a never-ending process). Again, I stand by my original estimation of the work when I finally saw a copy: it could have been a great resources, but the errors and problems prevent that. Nevertheless it is a very good resource, and should be interesting and valuable to readers. Squire's augmentation through the reader's diary makes it even more useful. And once I get permission from the compiler, I'm going to post a Table of Contents, etc. that should improve things still more. As I've learned, there are a lot of very weird things about publishing books (let's leave out, for the time being, publishers who refuse to incorporate an entire round of corrections an editor has made, telling that editor that they're sure all of those things were caught by the "team of professional copy-editors." They weren't. But anyway...). The biggest weirdness, for me, is the lag. Not so much the waiting (i.e., I waited 11 months for a reader's report on Beowulf and the Critics, although that's frustrating, it's not so bad) but the lag between when you were doing the work and when anyone actually reads the work and responds to it. For example, I began working on the ideas in How Tradition Works over a decade ago. I put them into their current form by the end of 2001 or the beginning of 2002. The book was published in May 2006. It's now January 2007 and the only reviews I have are on amazon.com. This is all weird because it's difficult to move on to the next thing before you get feedback on the first one, but if you wait that long, well, it'll be years and years between books. I have tried to avoid this problem in several ways, including writing articles for journals like Modern Philology, Neophilologus, Oral Tradition and Anglo-Saxon England as well as doing editing (Tolkien Studies, Tolkien Encyclopedia) and other projects, and I've also just tried to plug on ahead on the new book, From Tradition to Culture, which has finally started rolling along. But I've felt a little stuck, because the new book builds on the old, and I want to incorporate criticism (and refute arguments if need be). So I was very grateful when Squire of TheOneRing.net's Reading Room wrote a review of HTW. And I was even more grateful when, as you can see if you click on this link to the follow-up discussion, folks at TORN read his review and raised some very interesting points (and Squire then provided some additional information to them). This kind of feedback makes a big difference in changing the feeling that one labors in a vacuum versus working as part of an intellectual community (the other thing that made a big difference was that I used HTW in my senior seminar this year, and my brilliant students really helped me clarify my ideas still further). The proof (for me at least) is that now I've suddenly gotten un-stuck on a part of From Tradition to Culture, which all of a sudden is coming along nicely again. //Most people here, if they’ve heard of Michael Drout, know him as a leading Tolkien scholar. He is the editor of Tolkien’s Beowulf lecture manuscript; he is the editor of the journal Tolkien Studies; and he is the editor of the recently issued J. R. R. Tolkien Encyclopedia. Fewer may know what his ‘day job’ is. He is professor of Old and Middle English at Wheaton College in Massachusetts. As such he teaches courses in Old English, Beowulf, and Chaucer to undergraduates. If you’ve read his article, “Tolkien’s Prose Style and its Literary and Rhetorical Effects” (Tolkien Studies, I, 2004), you know that his knowledge of Old English allows him to approach Tolkien in a way that few here on TORn have even considered learning. Last year, as we in the Reading Room group were working on our contributions to the Encyclopedia under Drout’s editorship, I learned from Drout’s blog that he was simultaneously publishing another book. The title, How Tradition Works: A Meme-Based Cultural Poetics of the Anglo-Saxon Tenth Century (Arizona Center for Medieval and Renaissance Studies, 2006), was daunting, but I was intrigued. The cover showed a funny illustration of three medieval figures, seated on thrones, contemplating a long ribbon of Old English print that morphed into a DNA molecule and then bits of genetic code. Drout swore that the book was aimed at an educated general audience, and I’ve always loved genetic code stuff, so I took a chance and read the book. This is my report to you about my expedition into some serious Medieval studies, and into the mind of Michael Drout. The big picture is that Drout is trying to cross-fertilize two academic disciplines that are about as far apart as you can imagine: medievalists and evolutionary biologists. To put it more generally, he is trying to re-insert the humanities, which in his opinion are lost in their intricate and abstract literary theories, into the intellectual mainstream that is dominated these days by the cutting-edge empirical hard sciences, quantitative disciplines that prove things and get results. His vehicle is the meme. What is a meme? A meme is the “cultural” equivalent of a gene. If a gene is a molecular-scale entity that controls some aspect of an organism’s physical, bodily, development, then a meme is a highly discrete cultural act performed by humans: a word in a language, a way of cutting meat with a knife, a song always sung at birthdays. The essence of the meme is that it is transmitted: people learn cultural acts from other people. The argument by memetic proponents is that, just as genes are transmitted by reproduction, and are multiplied or diminished by the test of natural selection in the environment, so memes are transmitted by teaching or imitation and are multiplied and diminished by how well they serve the people who acquire them. Much of memetic theory is deliberately modeled on genetic theory, and a perfect storm of debate is now raging in certain circles about whether memes 1) exist; 2) have more than metaphorical meaning; and/or 3) explain everything about the development of human culture since apes stood up and used a stick to scratch their backs. Drout the medieval language scholar confesses up front that he is a secret science-lover. His childhood ambition was to be a synthesist or a polymath, someone who can learn all current knowledge, and explain it to you. One of his heroes is the late Stephen Jay Gould (one of mine, too, another reason I took a chance on this book), whose lucid and erudite essays from Natural History are things of epistolary beauty. So although Drout primarily loves and studies medieval literature, he refuses to let that put him in some ghetto where other branches of the Arts and Sciences do not exist, or do not have value -- particularly when he perceives their value to his discipline, if only he can stretch his mind around non-literary concepts. The upshot is that he has decided to try to apply memetic theory to the old problem of what “tradition” is in literature and culture. Derived from this is the more detailed problem of detecting, interpreting and explaining “influences” in literary works: examples of usage that recur in different artists’ works in different places or times that presumably show that one artist is “influenced” by another. And since he is a specialist in 10th century English literature and culture, he naturally wants to use his own hoary old subdiscipline as an example of a how a literary-cultural memetic theory ought to work. (Thus the meaning of his subtitle: “A meme-based cultural poetics”.) He sets out to show how the very new theory of memetics can help us understand the patterns of cultural behavior, innovation, and tradition that are found in very old texts. So, how does he do this? First, Drout takes us on an exquisitely thorough background tour of modern memetic theory, and the history of the Benedictine monastic reform that transformed England in the 900s A.D. Then we get to the heart of the book: a sequence of six chapters of close analysis of Anglo-Saxon literature. They show the various ways that the language and behavior of the Benedictine reform, embodied in the Rule (an amazingly detailed proscription of exactly what Benedictine monks were to do with themselves for, literally, every minute of every day of every year, forever), spread out and infiltrated not just ecclesiastical but also secular life and culture in England. And these chapters are hard. Drout admits that he had done much of the academic work here before he got interested in memetic theory, and that this book is a possibly “ungainly” post-facto integration of theory and scutlike field work in pure Anglo-Saxon studies. You don’t have to know Anglo-Saxon to read this book, but you’ll be skimming, or taking the author’s word on, propositions that Drout’s academic peers will be scanning for potentially fatal semantic or interpretational mistakes. My rusty Latin definitely helped me along at times; though, again, you don’t strictly need to know any dead languages to get the gist of the arguments. He reviews the effect of the Rule itself on the idea of tradition: how the Rule “replicates” itself explicitly by requiring that it be regularly read aloud to the monks who live by it, a classic example of memetic “self-preservation”. He analyzes the extant corpus of wills from the period, showing how their content, as measured by word-usage, was affected by the ideology of the Rule after it arrived in England. He pauses to comment on how Oral Theory studies have shown the power of repetition in preserving texts and by extension traditional behaviors – he interprets oral-formulaic repetition of text as the “self-replication” of word-usage memes. He moves on from content to style, taking up the problem of dating the Latin-to-Old English translation of Chrodegang’s Rule (a precursor to the Benedictine Rule); he shows how not just individual words but entire rhetorical formulations, considered as memes and meme-plexes, can be traced and linked to parallel stylistic usages in Benedictine-era documents, to place the Chrodegang translation squarely in the early 10th century. Finally, he tackles not just content and style, but aesthetics: the Exeter Book wisdom poems are metrical lists of proverbial dicta about medieval life, with a particular appeal to the aristocracy. Drout makes memetic connections between the underlying assumptions of the apparently secular wisdom poems and the spiritual ideology of the reform Benedictine Rule, showing how the reformers secured their position with the ruling class by projecting their monastic aesthetic into the non-monastic cultural life of literate England. Whew. That was brutal. As I said, this is not a book for kids. The upshot is, Drout is trying to quantify what “tradition” is. He believes memetic theory does an end-run around a lot of literary hot air and theory about tradition, by postulating a logical and consistent assembly of many small repeated words, phrases and beliefs into larger and larger assemblages of cultural behavior, all with strong intrinsic tendencies toward “self-perpetuation”. His literal argument is that the text of the Benedictine Rule, being both internally consistent, useful, and explicitly self-perpetuating, had a provable impact on its surrounding culture, creating an entire “era” that in retrospect constitutes a “tradition” within Anglo-Saxon history. But by casting the entire argument in the meta-language of memetics, he is attempting to show that this specific case-study is itself replicable – that his theory is its own useful, functional, and transmittable meme-plex. Through this book, it can be “transmitted” to English departments across the land and re-engage any tired literary sub-specialty in a new theory that works not just for English but for the entire humanistic academy. And let me conclude by saying this. I’ve radically simplified the sheer depth of this book. This is the product of literally years of hard clear thought and study. Drout’s passion for his topic is palpable. He writes fantastically well (as those who read his blog already know). If this book is hard and in places obscure, it’s also a wonderful intellectual excursion into a world that, without this author, I would probably never have gotten near. It reminded me in that sense of Hofstadter’s Goedel, Escher, Bach, a book that took me deeper into symbolic logic and recursion theory than I will ever go again -- but the memory of it as a sheer thrilling mind-adventure has never left me, after thirty years. Thirty years from now, I’m sure I will still remember the thrill of reading and understanding How Tradition Works. It is possible to imagine continuing such a program of research even further into the Middle Ages, perhaps going step by step through each century until we reached the present day, though I don’t know if there be world enough and time . . . I think it is more practical to try to investigate the idea of memetic “seeds” in both Victorian and twentieth-century culture, examining the ways that medieval and Anglo-Saxon memes are resurrected and how they shape the cultures in which they find themselves. Thus I can see the possibility of a memetic investigation of the pre-Raphaelites or the Gothic Revival in the nineteenth century and the development of fantasy literature, particularly the work of J. R. R. Tolkien, in the twentieth. A. What “memes” of traditional medieval literature do you find in The Lord of the Rings? Be specific. B. To what degree have they been transmitted from the original texts, thanks to Tolkien’s nearly-unique acquaintance with original medieval literature? Or have they been transmitted via intermediary texts and traditions like Victorian Gothic and Romantic revivals, as Drout may be suggesting? A while back I posted about the difficulty of obtaining essential research tools for Anglo-Saxonists, and that led to an interesting exchange with Tiruncula and Scott Nokes about the state of the field. I just discovered this post by Eileen Joy. Don't skip reading the comments, because that's where Eileen expands a bit more. Unfortunately I'm pressed for time right now (and will be for the next few days, as the semester starts on Wednesday), but did want to respond to a few things. First, I wasn't trying to be a "gatekeeper" for who is and who isn't an Anglo-Saxonist. If you can read Anglo-Saxon, you are, as far as I'm concerned an Anglo-Saxonist. I have no interest in telling people what they should be interested in: my idea of a healthy field is not a whole bunch of scholars beavering away on projects they hate but which are considered "important." However, as the origin of this discussion in a post about the danger of losing research tools might indicate, I am very concerned with the continued viability of the field, particularly in terms of tenure lines for people who study Old English literature and history and culture. Now that it looks like I cannot get out of taking my turn as Chair of my department, I am even more focused on such matters and on problems like budgets (for libraries as well as for tenure lines), research support and, most importantly, course offerings. I definitely do see "us" (i.e., people who can read Old English and want to study the culture and literature of Anglo-Saxon England, or more broadly, people who study literature and culture from before the year 1500) as having to compete for resources with other sub-specialities in our disciplines. If you want to construct this in terms of "identities," then the "them" is made up of people who want those resources for other things. I don't think these people are bad--they're my colleagues and friends. But they (and their discourses) do not put as much value on the study of the Middle Ages as I do. Therefore they want to direct finite resources elsewhere (i.e., if the English or History department gets a new tenure line, they would like it to be in rhetoric, or Asian studies, or film culture, or anything). I'd love to add a person in rhetoric, or one in Asian studies, but if History wants to replace the only medievalist tenure line with something else, then I will be making the argument that this is not a optimal use of resources. In making that point, one has to make an argument. I believe it would be easier to make that argument, and to win that argument, along the lines that I laid out in my previous posts: medievalists do certain things particularly well (yes, better than scholars of other eras). Therefore, if you make those particular things the criteria on which one defends a tenure line or arranges for a new one or competes for resources, you are more likely to win your argument. If you accept other terms, you are less likely to win (that's the "seemingly neutral rules pre-determine the outcome" argument that is one of my big takeaways from Foucault). I think that people in English in general and in medieval studies in specific will, on the balance, lose out to people in sociology, political science, anthropology, as well as history, if we define the "important" things in the field to be politics. Because we also have to learn multiple languages and because what we work on has the enormous challenge of being in the past, these other disciplines, on the whole, are going to out-compete us for resources (they already have over the past 75 years). But it might be possible to re-acquire some of those resources if we change the ground rules of the argument. The point being not to get rid of the analysis of politics or culture, but to augment that analysis with the deep understanding of language that all of us who work in English (actually any literary/linguistic study, but I know English best) already have. (This is where I was unclear in my previous post, and I apologize: I don't think anyone needs to go out and jettison their own work and become a linguist. I'm not--though I would like to be, and I'd like to be a better philologist and better Latinist and be good enough at Old Norse to do Skaldic poetry the way Roberta Frank does. The very fact that one is a student of language and literature means that he or she already knows an awful lot about language and the way it works. I am arguing for foregrounding that particular expertise as a way of winning arguments and thus retaining resources in a very, very competitive environment). One of the commenters on Eileen's post, John Walter, writes: "And we need to remember that the discipline of philology, and the greater Grimmian Revolution, as Shippey calls it, developed for nationalistic purposes." Question: Is there some specific passage in Deutsche Grammatik that you were thinking of here? 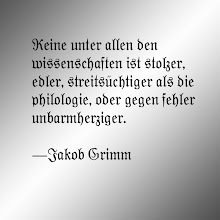 I admit I get bogged down in some of Grimm's German, but, while I can see an important analytical nexus between the Fairy Tale collection and the nationalist project (i.e., selection bias, etc. ), I can't remember anything about the substance of the laws of consonant sound change that I would be able to tie in to the nationalist project. I guess I'm really just asking for more specificity, as I've been reading a lot of 19th-century philology lately: where were you going with the "we need to remember..."? I now really, really appreciate the work of Matt Cavnar, my genius sound editor for Recorded Books. I've spent the past week editing my Beowulf Aloud (n.b., that link may not take you to the website for a day or two) recording of all of Beowulf in OE. It is truly exhausting, and just a little more than three hours of recording has taken at least twenty hours to edit (and it's not done yet, and it was already been edited to some degree--it's just that a regular editor isn't going to know what to edit for dramatic effect in OE; for example, reducing or increasing the length of pauses). But in between listening to Beowulf files, trying to finish off Tolkien Studies 4, which goes to the printer at the end of the month), and writing that "basic library for an Anglo-Saxonist" post (not quite done), I've been working on a couple of other projects, and I wanted to show the early stages of this one to my readers and solicit opinions and suggestions. Background: whenever I've worked with manuscripts, I've been both excited and frustrated by the way that information is presented. Excited, because the traditions of manuscript description have remained (mostly) unchanged and there is a wonderful element of ritual to reading someone's formal description of a manuscript (I imagine that the feeling I get is like what Stephen J. Gould describes in Wonderful Life about reading pages of anatomical description about the Burgess Shale fossils). Frustrated, because it is very difficult for me, from the descriptions, to get a real idea of how the manuscript is put together. So, with the help of a colleague in Computer Science, I am developing an interface that will take data about a manuscript and present it in graphic form. If this works, a user will be able to see the relationships within the manuscript. This is hard to describe but easy to show, so I've pasted in my sketch of the interface below. You'll note that you can see, immediately, the place of each text in the manuscript, the relationship of scribes to each other and to the texts (i.e., if Scribe A copies text 1 and part of text 2, while Scribe B copies the rest of text two and all of text 3). The date and provenance of the manuscript (and the Scribes, when they are identified) can then be used to link the manuscript to others of the same type (i.e., pull up all Winchester MSS from the 2nd quarter of the tenth century). These relationships will all be in the database (the design of which is the trickiest aspect of this project) and will be easily manipulated (i.e., a user can change a date or provenance on his or her own: you won't be constrained to Ker's judgements). The basic idea is for us to design the database and the interface and then just start putting the information from Ker into it. Eventually I can imagine a huge database that could be mined by different techniques to try to identify relationships between manuscripts. But mostly I was thinking of it as a tool for me and for my students so that we could more easily understand the way any given manuscript is put together. So, what do you think? Does the representation make sense? Is it intuitive? Would it help you to understand a given manuscript? Specific questions include: where do you think I should put Script? I had thought about putting it along the back edge, with the capability of being separated by text, but there are additional problems if you have different scripts for texts and glosses, though I imagine that could be solved by having multiple rows. Also, can you see a need for codicological data or additional physical description? The system is designed to have space in it for every single leaf, so pricking and ruling, dry-point drawings, etc. could be contained there. I was thinking that codicological units could somehow be marked along the front edge (where each "leaf" is, using some kind of color scheme), but I don't want things to get too out of hand, as the design is already very busy. We're still at the early stages of the project, so there's plenty of opportunity to make changes. I'm hoping that the many eyes/many brains of the web can help make the system useful. I just had the opportunity to read a paper completely outside of my field, in 20th-C / contemporary ethnic literature. The paper analyses novels which depict different kinds of immigrant and second-generation ethnic experience in America (say, the genre in which The Kite Runner exists, though about different ethnic groups, etc.). This was a good paper: it held my interest, deployed its theoretical material with confidence (i.e., not endless block quotes from Major Theorists) and showed some sensitivity to the literature. This paper has obviously been well-received. And there was, to my eye, an enormous, gaping, hideous lacuna right in the heart of it. In a paper that for twenty pages engages with issues of language--everything from accent, English as a second language teaching, to language performance, to code switching and use of multiple linguistic registers--there was NO engagement at all with work on language acquisition, second language performance, the phonology of 'accent,' code switching or any of the multitude of analytical tools that could come from contemporary linguistics (not to mention historical linguistics). Nothing at all. I am thus relatively certain that the author of this paper, who obviously went to a top-knotch literature program and is also obviously very smart, has not the faintest idea that there is an enormous body of knowledge that could be usefully deployed to support and enrich the arguments of the paper. The paper is instead 100% politics. Some of it sophisticated, some less so, but everything is taken as politics and nothing more. Now I'm not arguing that there should be no politics. In fact I can imagine that earlier criticism might have characterized the novels being analyzed entirely in terms of laws of sound change, second language acquisition, etc. without ever engaging in the politics of an ethnic, immigrant experience, and that would have been unfortunate: the analysis would have been incomplete. The political discussion in the paper actually is interesting and useful. But it is radically impoverished by the lack of engagement with Language, and I think this is exceedingly unfortunate, because other departments can do politics and sociology, and probably can do them better than English professors. But only English professors are trained (or used to be trained) to be able to analyze language: that should be our great advantage, the strength we should bring to the game. But instead, we're transforming what should be our own field into someone else's and, let's face it, we are never going to be as good at analyzing politics as the political scientists, as sharp on sociological discussion as the sociologists or as good at philosophy as the philosophers: there simply isn't enough time to learn those things and to learn about literature and culture. Thus we end up doing politics-lite or sociology-lite or philosophy-lite (see Scott Nokes here) and also not doing justice to the things we are actually good at doing. It's no wonder our departments have sunk in prestige compared to our colleagues: it's not troglodyte conservatives whipping up the alumni and the general public against leftist politics (all the departments of higher prestige are just as full of leftist academics); it's our own bizarre decision to play in their games by their rules and to pre-emptively surrender our greatest advantages. I want to emphasize that I am not making the argument that there should be no politics or sociology or philosophy in English. And I don't actually see how one could have language analysis without history. But those other disciplines should be subordinate to what we should be able to do best: analyze language, narrative and culture in ways that are not easily accessible to political scientists, sociologists or philosophers. Our game should be played on our home field. Tiruncula (whom I'm guessing I know in real life, but have really no idea about) writes a very interesting post about the "state of the field" in Anglo-Saxon studies, prompted by my post here. Although her post is optimistic and mine was pessimistic, I think I mostly agree with what she says. Anglo-Saxon studies is very collegial, and although a few institutions are dominant (Cambridge, Toronto, Oxford), really many of the best people are scattered all over the place, which somewhat reduces overt snobbery, etc. And, as I've said before, medievalists in general and Anglo-Saxonists in particular tend to be more gregarious, fun and just plain happy than English professors in other disciplines. It's also a really intellectually exciting time to be an Anglo-Saxonist, with new areas for study opening up. All of these factors combine to make it a good time to be an Anglo-Saxonist (albeit with all the difficulties of job market, etc. that I've discussed in many other posts). But I am not at all sanguine about the future of the field because I think it would be very easy for Old English studies to end up even further marginalized and then to become extinct in all but a few places. Twenty years ago no decent English department would have thought it acceptable not to have at least a medievalist, and probably two, one for Anglo-Saxon and one for Middle English. Now that is not the case; it's probably intellectually acceptable in many places (n.b. : I look down on those places and don't respect them, but that doesn't seem to stop anyone) to eliminate early medieval entirely and just have a Chaucerian. At other places (even less deserving of respect) medieval positions are being combined with Renaissance. The line probably gets drawn there, as Shakespeare is, one hopes, safe from tenure-line poaching by later periods, but if trends continue, I think that a lot of departments will take what should be (say) three tenure lines (Anglo-Saxon, Middle English, Renaissance) and combine them into one, peeling off the other two for still more 20th-C or contemporary literature (by the way, I think that the 18th century is likewise vulnerable to poaching, and for similar reasons: it is perceived, incorrectly on both counts, as 'too hard' for students and 'too boring'). So Tiruncula's point that the field is healthy from the inside (i.e., intellectually) and my point that the field as a whole is not in the best of shape (i.e., economically, politically etc.--) can be reconciled. Using an ecology metaphor, you might say that Anglo-Saxonists are like a species that's healthy, genetically diverse and parasite free but whose habitat is being rapidly destroyed. Two related questions, then, would be 1) Why is the field in the shape it is in? (2) What should we (or can we) do about it? Tom Shippey's essay in Æstel, which I referenced here suggests some answers for question 1: a). poor pedagogy caused by a tradition of compulsory OE (and in response to commenter Prof. de Breeze, not that compulsory OE is intrinsically bad, but that its existence allowed for slack teaching: if you know that you've automatically got X number of sections of OE, there's less incentive to work particularly hard to teach circles around the competition, the way that Anglo-Saxonists can almost uniformly do now); b) poor teaching instruments (the craptastic Clark-Hall dictionary, grammar books aimed at students who have had four years of Latin and Greek, etc. ); c) the perception that Anglo-Saxon studies is male, white, Christian and warrior-focused and the history of pan-Germanic nationalism and its connection to philology and medieval studies. To this group of problems, Allen Frantzen added a lack of engagement with literary theory: our colleagues could feel safe in ignoring us because we were not talking in the same way: we had self-marginalized. I agree with Tom about all of these things, and Allen was right, also (though he was far too charitable to the modernists, who did not turn around and embrace Anglo-Saxonists when we started doing theory) but I would add two other major problems that to some extent overshadow these others (and, to continue with the theme of agreeing with Tom about an embarrassing number of things, he expressed some of these ideas in a response to a set of Kalamazoo papers a couple of years back). Anglo-Saxon studies and philology are a highly irritating rebuke to most of the rest of the sub-disciplines in English because our intellectual practices are a direct refutation of one of the central dogmas of literary studies: that all "knowledge is situated and contingent." All knowledge is not "contingent and situated," and although Anglo-Saxonists may pay lip service to that piece of dogma, we don't actually believe it (or at least we don't act as if we believe it). Outside of the Humanities no one believes this, anyway (except in the most pathetic, freshman-philosophy sense). There are lots of forms of knowledge that are contingent and situated (Foucault actually demonstrates some of these areas in regard to, say, sexuality or mental illness), but it is a huge intellectual mistake to take the overstatements characteristic of French philosophy (and of Foucault personally) and act as if they are true. ‘The American woman’ had become capable and independent, having been ‘reclassified almost overnight’ as fit for heavy industrial work, after Pearl Harbor…Hollywood addressed itself to this increasingly dominant female audience in terms of pleasure, but also in terms of war effort, showing women as workers, as well as patriotic, optimistic, and supportive wives, sweethearts and mothers (Martin 203). Martin continues this line of argument, suggesting that, after the war, women became classified as “excess labor” (203) and that the re-emergence of the noir thriller was related to women returning to a domestic role. Now it seems clear to me that Grimm's Law is on an entirely different level of contingency and situatedness than Martin's criticism and that we make a very large intellectual mistake when we do not recognize this. To the credit of Anglo-Saxon studies, I think it is highly unlikely that any of us could (or would try) to get away with presenting historical and economic analysis in such broad terms. So, when we use boilerplate like "contingent and situated" (whether we believe it or not) we are in effect engaging in pre-emptive rhetorical surrender: we are deprecating our own strengths and playing to our weaknesses, for it is much harder to do the kind of broad-brush cultural/political criticism that is standard practice in 20th-century literature when you also have to establish all the kinds of historical, philological and manuscript contexts the way we do in Old English. Martin can do this stuff for Film Noir because "everybody knows" the historical/economic assertions upon which her argument rests. This leads me to my second point, related to the first: for those of our colleagues who know how we work, philology and the kinds of historical criticism that Anglo-Saxonists do is an irritating rebuke to standard dogma. But far too many of our colleagues (and even more of their students) really have very little idea of what we do because they are appallingly ignorant about language. I would not wish my criticisms of Chomsky to be misunderstood. At a time when various embarrassingly incompetent accounts of language are widespread in university humanities departments under such names as "literary theory," "deconstruction," and "postmodernism" it is worth emphasising that his work in linguistics is at the highest intellectual level. That's what a philosopher of language (and frequent interlocutor of Derrida) thinks of the English department's use of philosophy of language: "embarrassingly incompetent." His point is that there are scholars who know how language works, but they are in departments of linguistics, not departments of English. I think he is right in broad terms, but he is ignoring Anglo-Saxonists, who do know how language works (and the most important thing about how language works is that it changes in certain regular, though complex, ways). But we are a distinct and embattled minority in English departments. And, I would assert, we are in such a minority position exactly because we possess knowledge and disciplinary practices that call into question the work that other members of the profession do, and so for them the easiest thing to do is to ignore and marginalize us. This can be done visibly and visciously, by accusing racism, sexism, etc. (Shippey's comments about pan-Germanic nationalism and its implication in philology), or subtly, by insisting as dogma that all knowledge is contingent and situated. In both cases the result is to replace Anglo-Saxonists with colleagues whose sub-disciplines are more amenable to the dominant paradigm (ha! I used "dominant paradigm"). Well, given the tone of the above, you would expect that I would be raging against other time periods and sub-disciplines, who, threatened by our intellectual superiority, are squeezing us out. But in fact (and this is how you can tell I'm Allen Frantzen's student), I think we should keep trying to reach out to our colleages because we have something they need. But in order to offer them what they need, we have to stop playing false and agreeing to dogma about our knowledge. We practice, as one of my students said with joy and wonder "English with right and wrong answers." We should show how this is valuable and how our colleagues do need us. According to the New York Review of Books, in the early 1980s there were 65,000 English majors in American universities. Given the population increase among students, we should have had 130,000 English majors in 2002. But the actual number was 49,000. Those are very bad numbers, and the entire profession really should take notice. Expanding the canon was intellectually good, but it has done nothing to change the direction of the change. Diversifying the faculty may have been (may still be) the right thing to do, but it is not pulling in new majors. Trying to make the major more appealing to students by focusing more and more on 20th-C and contemporary literature has not increased the popularity of English. Maybe the trick isn't to continue doing more of the same, but to try something different. I would submit that the "something different" we should do is to focus on language and how it works in a historical sense rather than an abstract philosophical sense. Literary studies suffers from a continuous pull in two directions: towards solipsism and towards politics--you end up with "that text means this to me" or "that text illustrates this political/social phenomenon." The best English criticism resists this pull (not overcomes, just resists) keeping English as something more than the book club discussion or the dormroom bull session. Philology, detailed historical scholarship, manuscript work--these disciplines help resist that pull; they make English much more interesting. I believe that a renewed focus on language would thus re-invigorate the discipline, bringing in more students and helping us to argue to parents, legislators and critics that what we do is valuable not just in terms of some kind of nebulous "critical thinking," but in really specific terms. This would mean a serious engagement with contemporary synchronic linguistics as well as historical linguistics, and with the cognitive psychology of reading and memory, as well as with conditions of physical and economic production, distribution and evaluation of literature (the kind of work which is done outside of medieval studies). This has been a grumpy post, but in fact I am very optimistic that our students do want to learn about how language works. My medieval lit class this semester (which will have a sizeable Old Norse component) has over 40 students and my Chaucer class 22 at a small liberal arts college where the average course size is 15. Those enrollments aren't due to my sparkling personality, but to students actually being interested in the older material and in the approach. I think there could be very good times ahead for medieval studies if we make the right kinds of arguments, if we don't surrender pre-emptively, and if we recognize and express the great value in what we do. Would you share a representative list of what a crusty old english professor might keep in his library (for the edification of the dilettantes frequenting your blog)? Although I dearly hope I am not yet Crusty (though I do a good immitation of Krusty), I am clearly on the rapid train to that destination (first stop: have children; second stop, start shaving head to save time in morning; third stop: begin sentences at department meetings with "When that was proposed ten years ago...."). And I think this is an excellent question (if it's not some kind of a "humiliation game" set up, where I reveal that I have not a single book by some eminent person on my shelves). It's also a big question, so I'll tackle it in two parts. The first is easy: I'll post some pictures of my actual shelves with enough details so that you can recognize the books. This also lets me show off the shelves, which are part of a massive floor-to-ceiling bookcase that wraps around one wall of our study. My wife and I designed built them ourselves, and we will never do that again, ever. Maybe excavate a well or pour the foundation for a porch, but nothing challenging like designing and building a few hundred linear feet of bookcases. So, if I can get the new computer running tomorrow before this one finally dies for real, I will post some bookcase Pr0n for you (and academics are terrible voyeurs about other people's books. I always know that my books will be picked over when I have someone over to visit), I'll post the pictures. And while I'm working on that, I'll try to come up with a list (linked to Amazon for in-print titles) of the books I need to do research without having to leave the house very much. People on ANSAX have attempted to put together such lists before, but these always falter on the shoals of sucking up: you must mention your director's book and the other books you think will make you look cool, and something so minor that it appears you are cornering the market on that sub-field (Drout's hint: you know why there aren't a lot articles about the Whale and the Partridge poems in the Exeter Book? Becuase they're not that great and there's not much to say -- see my article in Neophilologus that should be out soon for a example of how much work is required to enter into a seemingly empty area of the field). So I am going to use myself as a guide in the sense that most of the books I will list, I will have. That means that certain kinds of books--interpretations, essay collections that are uneven--may not be on my shelves because these are easy enough to get from some kind of Interlibrary Loan, even from a fairly marginal public library. I will do my best to put no up-sucking in this list, at least at the "core" area. And it will all be focused on Old rather than Middle English (mostly because I've moved a big pile of my Middle English interpretive books to my office in order to be able to loan them to students next semester).